Australia's Daria Gavrilova claims her first WTA title, rallying for a 4-6, 6-3, 6-4 victory over Dominika Cibulkova in the final at New Haven, Connecticut. 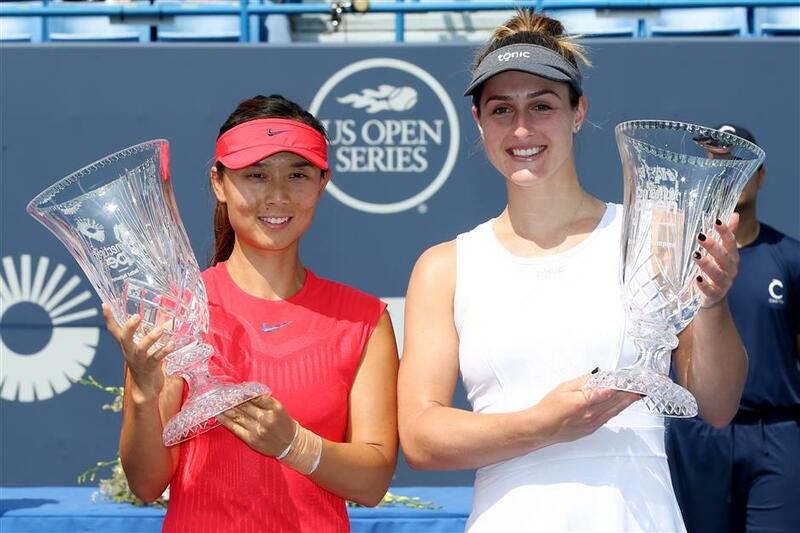 Xu Yifan of China and Gabriela Dabrowski of Canada pose with their trophies after beating Australians Ashleigh Barty and Casey Dellacqua 3-6, 6-3, 10-8 in the Connecticut Open doubles final at Connecticut Tennis Center at Yale in New Haven, Connecticut, on August 26, 2017. 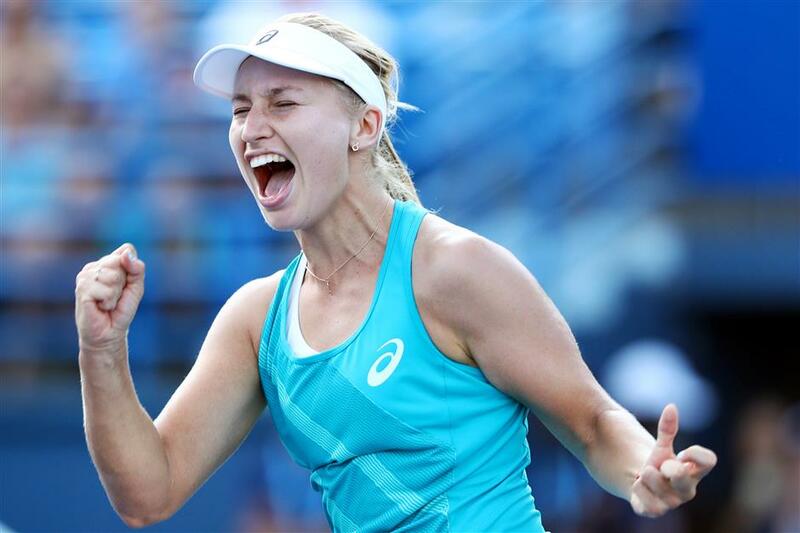 Daria Gavrilova doesn't hide her emotions on the tennis court — and she put them on full display on Saturday in winning her first WTA tournament title. The unseeded 23-year-old Russian-born Australian upset second-seeded Dominika Cibulkova 4-6, 6-3, 6-4 in the Connecticut Open final at New Haven. She finished her comeback from a set down by breaking the 11th-ranked Slovak in the final game, hitting a forehand winner, throwing her racket and jumping into the air in jubilation. The match was extremely close with Gavrilova winning 105 points and Cibulkova taking 102. "It's even more special to win it that way, against such a tough competitor," she said. "I think I've beaten some great players to win my first title." Gavrilova beat top-seeded Agnieszka Radwanska in the semifinals and is 9-18 in her career against top-10 opponents. Cibulkova came in ranked 11th. She had been as high as fourth this season. Gavrilova, ranked 26th in the world, gesticulated wildly throughout the match and yelled "Come on" after every big point. That included the turning point in the match, when she broke Cibulkova to go up 3-2 in the second set in a game that featured a 30-shot rally and five deuces. "I told myself when it was, like, third time deuce, I said that it might be the turning point, to fight for every point," Gavrilova said. Both players had problems early serving into the sun. There were five service breaks in the first set all from the same end of the court. Cibulkova broke at love in the 10th game to take that set when Gavrilova hit a shot into the net and then screamed in frustration. Cibulkova relied heavily on her forehand, making winner after winner. She had 32 of them in the match, but Gavrilova had 35. The Australian broke Cibulkova again in the ninth game of the second set, pumping her fist wildly as she sent the match into a third set. The two also traded breaks in the third set before the decisive 10th game. "I always had this one point that I didn't make," Cibulkova said. "I just say it was always 30-15 for me, then small out here and there. That's what I'm talking about, these one, two points that would not go my way." Cibulkova, who won four times on tour last year, has not had a victory this season. She was looking for her ninth career win and her first in New Haven in her 8th appearance at the tournament. She had never before made it past the quarterfinals. Gavrilova began playing for Australia in 2015 after moving from her native Russia at age 18. She became the first player to win her first WTA title in New Haven. Neither player will get much of a rest before Monday's start of play in the US Open. Cibulkova will face fellow Slovak Jana Cepelova in the first round and Gavrilova will face American Allie Kiick. "It's so worth it, winning your first title," Gavrilova said. "Of course I gave my all." Daria Gavrilova of Australia celebrates after defeating Dominika Cibulkova of Slovakia to win the Connecticut Open at Connecticut Tennis Center at Yale in New Haven, Connecticut, on August 26, 2017. In Winston-Salem, North Carolina, top-seeded Roberto Bautista Agut beat Damir Dzumhur 6-4, 6-4 on Saturday in the Winston-Salem Open for his second ATP World Tour title of the year and the sixth overall. Bautista Agut, the Spaniard ranked No. 15 in the world, became the first player in the seven-year history of the tournament to not lose a set in any of his six matches. He won a year after losing the final to compatriot Pablo Carreno Busta. "It was a tough final, but I played very good tennis all week," Bautista Agut said. "I wanted to try to arrive at the final and it was a very good week for me. And it's been a very good year for me now, too." The unseeded Dzumhur was the first player from Bosnia-Herzegovina to reach an ATP World Tour final. "I started both sets love-three down and came back, but it's not easy to win after being down love-three to win a set against any player, but especially against Roberto, who played a great week," Dzumhur said. "He played with a lot of confidence and played big points so good, especially both sets at four-all. He played great points and great passing shots, and I just didn't have a lot of chances in those games." Bautista Agut broke at 30-40, closing out the match when Dzumhur's forehand sailed long at 30-40. Bautista Agut had a chance to win the match on his serve when he led 5-3, but was broken at love. The Spaniard broke Dzumhur to win the first set, then won the first three games of the second set before Dzumhur rallied to win the next three games and tie it 3-3. Bautista Agut held serve in the next game to take a 4-3 lead and broke Dzumhur again on a lob shot that hit the baseline for a 5-3 lead.